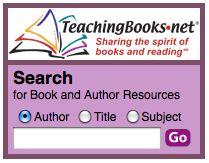 Explore ways you can share and promote TeachingBooks.net throughout your community. Click any section header below or use the left navigation to learn more about each topic listed below. Forward this email to colleagues to inform them about TeachingBooks.net.